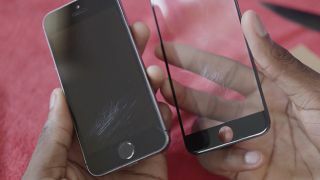 The purported iPhone 6 sapphire display panel came off worse in an encounter with a sheet of sandpaper in a new video test, ending hopes the new screen tech would be completely scratchproof. After taking a knife and keys to the display with no negative impact, YouTuber Marques Brownlee decided to get serious with some rather coarse sandpaper, in his latest post. Compared with the Gorilla Glass iPhone 5S display, the iPhone 6 emerged from the battle in better shape, showing the new material is indeed tougher, but by no means invulnerable. That led Brownlee to the conclusion the display is not pure sapphire, which is higher on the Mohs scale of hardness than the sandpaper used in the test. Pure sapphire (a 9 out of 10 on the scale) would not have been scathed by garnet sandpaper, which gets a 7 out of 10 rating. Interestingly, the TouchID sensor on the iPhone 5S was undamaged by the sandpaper test, suggesting it is indeed a purer form of the sapphire material than that used in the rumoured iPhone 6 4.7-inch display. Brownlee says a mixed-material screen makes sense because: a) pure sapphire would be super expensive and b) the compound allows the screen to bend a little. You can view the sandpaper test in the YouTube video below. In other news, Joe Rogan fired an arrow at the display using a sick bow and arrow. You can see how that worked out in the clip below. Are sapphire displays the gem of the mobile world?